Vintage20 is pleased to announce its recent collaboration with Savannah College of Art and Design (SCAD) and their gallery in Lacoste, France. The SCAD exhibitions department in in conjunction with Vintage20 presents "Jean Prouvé: Sélections," an exhibition including important pieces by the internationally renowned modern designer (1901-1984). This exhibition, which is on view from April 14 through June 16, 2012 at SCAD Lacoste's Galerie Pfriem as part of the 2012 SCAD Style program, brings together an intimate collection of objects including chairs, a lamp and table that highlight the artist's innovative practices and exemplify his impact on modern and contemporary design. Jean Prouvé's designs are known for their blend of craftsmanship and industrial materials. A pioneer in principles of prefabrication, Prouvé focused on production methodologies for lightweight, efficient and portable pieces throughout his career. In the 1920s, he became known for his folded steel furniture pieces, and in the early 1930s for mass-producing institutional pieces for the public sector. After World War II, when steel became scarce, Prouvé began working with wood and aluminum. Now considered one of the most forward-thinking engineers and designers of the 20th century, Prouvé developed innovations in manufacturing processes and advanced the principles and aesthetics of modern design. 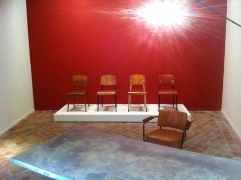 Featured as part of "Jean Prouvé: Sélections," are variations (from 1940 to 1950) on his most recognized design - the "standard chair" - which was used in the public sector in institutions ranging from health to educational buildings. 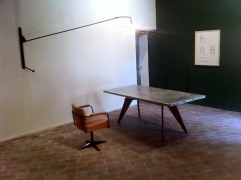 Also on view are Prouvé's Aluminum Dining Table and the Swing Jib Lamp, an industrial fixture that highlights Prouvé's interest in functionality and portability. "Jean Prouvé: Sélections," complements the SCAD School of Building Arts curriculum, which is being offered in Lacoste this spring, including furniture and interior design, architecture and architectural history. This exhibition was realized in collaboration with Vintage 20, a Manhattan-based firm specializing in mid-century European furniture and decorative art that showcases museum quality works from pioneering designers. About SCAD Lacoste: SCAD's residential study-abroad location in Lacoste, France, offers immersion in the rich culture of Provence. Lacoste is a beautifully preserved medieval village, known by artists for its extraordinary light and exquisite pastoral setting.